As we planned our vacation Eric and I were debating about bringing disposable or cloth diapers to the beach. We already had a lot of stuff to transport, so did we really want to bring another bag/bin of stuff? Then we thought, we bring them on our 3 or 4 day weekend trips, unless we're flying. We had never gone away longer than that with our cloth diapers. The rental house we stayed at had a washer and dryer included so that helped make our decision. Maggie has a pretty sensitive bottom so we worried about her being in disposables for 7 full days. I told Eric that we'd take the diapers only if we had room in the car. We made it work! 18 diapers (enough for 2 full days plus a wash day) I packed all-in-ones and then my ocean print pockets (duh!). 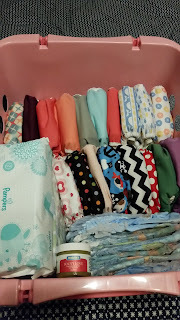 I wanted my easiest diaper stash because, VACATION! We use disposables on travel days. It makes our potty stops a little less cumbersome and we don't have to worry about wet/stinky diapers sitting in the car all day. 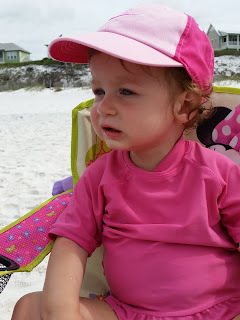 Because disposable swim diapers aren't made to hold pee, just poop, it doesn't make sense to me to put the kids in swim diapers just to play around on the beach. We put them in regular cloth diapers and a swim shirt until they actually go in the water. When it's time to swim, the dirty cloth diaper goes into the wet bag (or plastic grocery bag is fine!) and on goes the swim diaper. Wearing a rash guard or UV shirt instead of a bathing suit makes this so easy. There are so many cute ruffly swim diapers to pair with rash guards for a cute look. After a good swim I put the regular cloth diaper back on. On this particular trip the pool was in our back yard. 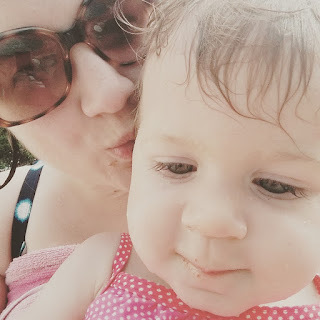 I put the girls straight into a swim diaper and used their cute one piece suits for swimming. Pee is inevitably going to leak out of any kind of swim diaper. They are really just there to prevent brown sharks...if you know what I mean. 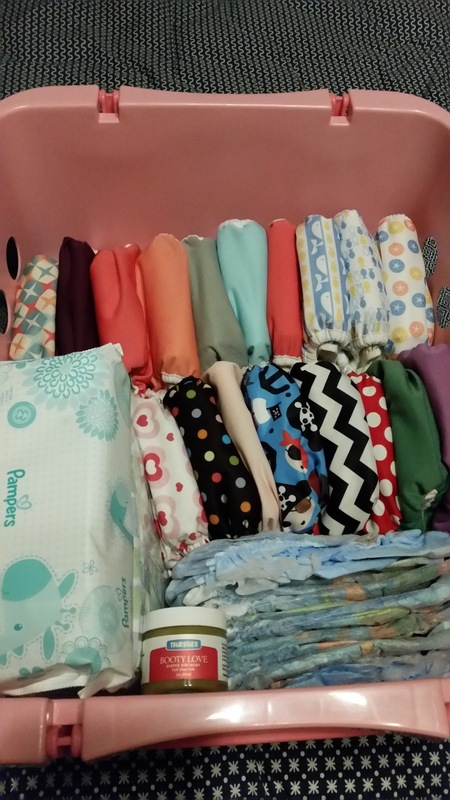 I choose my easiest to wash and care for diapers for long trips: usually my stash of All-in-ones! Using liners helps manage poop. Even if you don't do this at home, it's good to stock up for traveling. Because it was vacation in a rainy/humid area I just threw everything in the dryer so it was ready for the next day. I also washed everything our last night and put Maggie in disposables. Again, I didn't want to drive home with stinky diapers. This way when we arrived home I already had clean diapers and could save the washer for getting our clothes washed! Look for one with at least one side that snaps, two is ideal. Pulling down a wet poopy diaper...just no. You'll want side snaps, trust me. Make sure all the elastics are tight around the legs and waist, but not so tight that they cut off circulation. Have you traveled with your cloth diapers? What tips or tricks do you have? Any questions?